The second meeting of the governors of the Northern Forum, Sustainable Development of the Northern Regions, will take place on the sidelines of The Arctic: Territory of Dialogue 5th International Arctic Forum. "The Northern Forum, being a tool for the development of non-political dialogue between the governors of Arctic and northern regions of various countries, municipality heads and organizations, is designed to become an example of an effective international cooperation, non-dependent on the external environment, in order to maintain the sustainable development of the Arctic. The meeting of Northern Forum governors will take place for the second time during the International Arctic Forum and will give us an opportunity to discuss issues related to improving the quality of life of Northern peoples, and to exchange knowledge and experience in solving common tasks and promoting joint social and economic initiatives," said Russian Presidential Adviser Anton Kobyakov. Participants in the second governors' meeting will discuss the sustainable development of the North and the Arctic, as well as the draft strategy of the Northern Forum, which has been developed with regard to proposals made by member regions and experts since 2017. The second governors' meeting will bring together heads and representatives of the Northern Forum member regions, regional coordinators, business partners, experts, representatives of Arctic and non-Arctic states, as well as Russian and international organizations that are not members of the Northern Forum. The agenda will include speeches by Northern Forum Chair, Governor of the Nenets Autonomous Area Alexander Tsybulsky; Northern Forum Vice-Chair, Governor of the Khanty-Mansi Autonomous Area-Yugra Natalya Komarova; Northern Forum Vice-Chair, Head of the Republic of Sakha (Yakutia) Aisen Nikolayev; Governor and Prime Minister of the Chukotka Autonomous Area Roman Kopin; Ambassador-at-Large of the Russian Foreign Ministry Nikolai Korchunov; Alexander Pilyasov, Doctor of Geography, Professor, Director of the Center of Northern and Arctic Economy at the Council for Productive Forces Research, Chair of the Russian Section of the European Regional Science Association and Chair of the social and economic section at the Expert Council on the Arctic and Antarctic under the speaker of the Russian Federation Council, General Director of the Regional Consulting Institute; Head of the Arctic Institute for Circumpolar Reindeer Husbandry (UArctic EALÁT Institute) Svein Mathiesen; Managing Director of the CHNL / Nord University Business School Kjell Stokvik; Chair of the Russian State Duma Committee on Regional Policy, North and the Far East Nikolai Kharitonov; Council President of the Association of World Reindeer Herders Sergei Kharyuchi; Professor of Arctic Politics at the Faculty of Social Sciences, University of Lapland Lassi Heininen and Director of the Arctic Portal Halldor Johannsson. 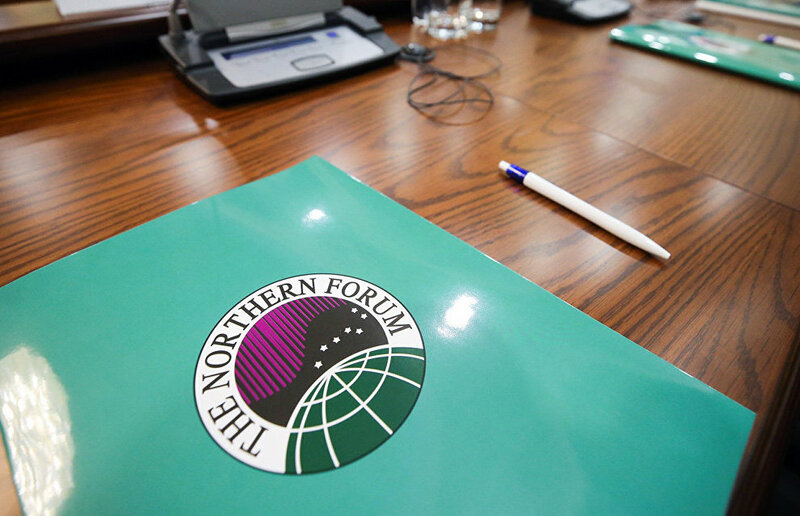 The Northern Forum was founded in the early 1990s as a platform for strengthening non-political dialogue between leaders of both subarctic and non-Arctic states. The Northern Forum currently comprises ten northern regions of Russia, Akureyri (Iceland), Alaska (US), Gangwon Province (South Korea) and Lapland (Republic of Finland) plus 12 business partners from Iceland, Norway, Russia, the US, Finland, France and Japan.